doesn't fit that stiff, stodgy "you can't get there from here" cliché that springs to mind when folks think of Maine. No, this sleepy little seaside town is about as bright-eyed and friendly as they come. I mean, the movie opens with a bubbly, impossibly gorgeous blonde (Lisa Blount) posing for a photographer visiting from out of town, and just a few frames in, she unbuttons her top and offers herself to him. That's small-town hospitality. It's just the way of life up here in Potter's Bluff -- shrugging off dinner to open up the gas station for folks passing through or offering pretty young things on the side of the road a much-needed lift -- at least up until the point where a small army of townies swarm together and savagely butcher them. unspools is subdued but more effectively creepy than I ever would've expected, and I can't help but cackle with glee at that disturbing, final twist. Dead and Buried boasts an impressive selection of talent on both sides of the camera. Alien alums Dan O'Bannon and Ron Shusett are credited with the screenplay, Richard Kelly's preferred cinematographer shapes the look of the film, Academy Award winner Joe Renzetti contributes an unconventional, moody score, and the cast includes turns by a slew of recognizable character actors, including Robert Englund, Barry Corbin, and, most memorably, Jack Albertson devouring every scene he's in as he plays far against type. 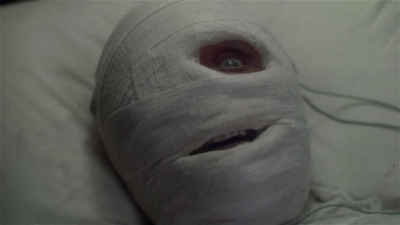 Stan Winston only had a handful of credits under his belt before tackling the extensive make-up effects in Dead and Buried, and despite his relative inexperience in these early days as well as the film's modest budget, the talent on display here is still startling. From Winston's wholly convincing lifelike puppets to a butchered hitchhiker reconstructed layer by layer, from bone to flesh, Dead and Buried's effects still hold up astonishingly well nearly thirty years later. The lone exception is the one kill Winston didn't field, and it's inept, distracting, and really doesn't even fit into the logic of the film. There are a few other scattered plot points that don't hold up to close scrutiny either, but they're easily shrugged off. Although the commentaries on this Blu-ray disc are teeming with horror stories about clumsy re-edits, forced insert shots, and a disinterested studio, I really wouldn't know it just to look at Dead and Buried. 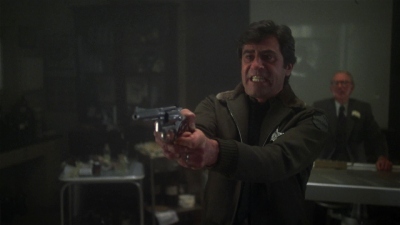 Kind of like a vintage Twilight Zone episode sopping in early '80s splatter, Dead and Buried manages to be eerie and dreamlike while still standing out as about as visceral and gruesome as much of anything else from the class of 1981. Barely released and underappreciated in the years since, Dead and Buried was rescued from obscurity by Blue Underground who gave the film a lavish two-disc special edition release on DVD, and it's now among the company's first horror films to bow on Blu-ray. This isn't the sort of movie I'd expect to be an early high definition release -- dark, dingy, and about as grainy as they come -- but I'm thrilled to see it on Blu-ray just the same, and for genre fans disappointed by the lackluster selection of horror on the format, Dead and Buried is essential viewing. Recommended. Director of photography Steve Poster opens his audio commentary by delving into Dead and Buried's intensely stylized visuals, and this is a film that's deliberately dark, diffused, desaturated, and exceptionally grainy. Blue Underground brought Poster onboard to supervise this high definition transfer, and although Dead and Buried doesn't exactly sparkle and gleam on Blu-ray, this disc does faithfully reproduce its unconventional cinematography. Detail and clarity are modest but an improvement over anything I'd expect to see on a standard definition DVD. The heavy veil of film grain is crisply defined, showing no trace of being processed away into a muddy smudge through excessive digital noise reduction, and there's no wear or speckling worth noting. The only flaw I could spot -- the only flaw that Poster couldn't explain away in his commentary, at least -- is some distortion in a set of sheer curtains flapping away in a dingy hotel room. Otherwise, this dark, gritty film looks about as perfect as it realistically can on Blu-ray. Blue Underground opens the mattes slightly to reveal an aspect ratio of 1.78:1, and Dead and Buried's VC-1 encode is given plenty of room to breathe on this dual-layer Blu-ray disc. Dead and Buried features a pair of lossless 7.1 soundtracks: one in DTS-HD Master Audio and the other in Dolby TrueHD. I'm assuming the movie was originally mixed in mono, and these remixes don't veer obnoxiously far away from that. The use of the surrounds is largely atmospheric -- lapping waves, a bleating record player, and creaking wood, for instance -- and never feels forced or gimmicky. There's also some directionality to a few short stretches of dialogue. The stems are in reasonably good shape, not marred by any distracting hiss or pops, although the track does understandably sound kind of flat and dated. Dialogue is dialed a notch or two lower in the mix than I would've preferred but is still consistently discernable throughout. Bass response is expectedly light too, with most of the activity in the lower frequencies owed to Joe Renzetti's reasonably full-bodied score. Dead and Buried sounds alright on Blu-ray, and it's more or less what I went in expecting. It's a bit of a disappointment that the original monaural soundtrack hasn't been included -- it's on the DVD, after all -- but the lossless soundtracks take so few liberties with its original sound design that it's not too much of a loss. A DVD-quality Dolby Digital 5.1 EX track (448Kbps) has also been included alongside subtitles in English (SDH), French, and Spanish. Flash Gordon's Melody Anderson co-stars as the sheriff's wife. This Blu-ray disc does lose a few poster and still galleries, but otherwise, all of the extras from Blue Underground's two-disc limited edition DVD set have been carried over. Its featurettes and trailers are all presented in standard definition and anamorphic widescreen. Audio Commentaries: Dead and Buried features three audio commentaries, each moderated by Blue Underground mainstay David Gregory. These commentaries are available through the "Setup" menu rather than offered with the rest of the extras. The first and best of the lot features director Gary A. Sherman, who devotes much of the discussion to just how drastically Dead and Buried was carved apart and reshaped from script to screen. Other highlights include the unfortunate destruction of his original director's cut, the deliberately unconventional camerawork, and a visual style that shied so far away from red that cars were refitted with purple tail lights. The second track pairs co-writer/co-producer Ron Shusett with his wife, actress Linda Turley. Despite having more folks onboard than either of the other tracks, this is by far the most subdued and forgettable of the three commentaries. Still, it's the only extra on this disc to more intensely touch on the business side of filmmaking, and I also enjoyed hearing about his criticism of the first two acts of the movie, a successful novelization he edited and partially rewrote even though the film itself was still a year off, and how much Hitchcock influenced the storytelling. Shussett also touches on the collaborative writing process behind Total Recall and Alien. His wife is pleasant enough but really doesn't have all that much to say, though. conversation with cinematographer Steve Poster. It's a very technically-oriented discussion, heavy on notes about specific camera movements and lighting, but I really enjoy these sorts of commentaries. Some of my favorite notes include how much prototype gear was experimented with throughout the shoot, an apology for crosshatching from a net in one early scene, a cameo by one of the rats from Willard, blasting a live chicken through a window with an air gun, what the rest of the crew is up to these days, and his preference for being closely involved when his films are transferred to video. Stan Winston's Dead and Buried EFX (17 min. ): From elaborate, lifelike puppets to recreating a battered hitchhiker layer-by-layer, the veteran -- and already greatly missed -- effects wizard delves into the work he invested into one of his first feature films. Robert Englund: An Early Work of Horror (12 min. 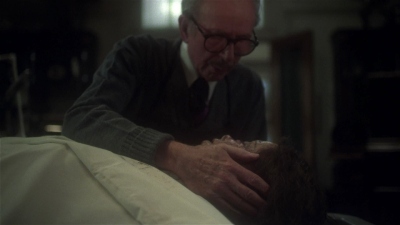 ): The once and future Freddy has a very small part in Dead and Buried, and he chats about the cold, foggy shoot in Mendocino, the small army of character actors with period faces on the payroll, and working with Stan Winston in these early days in his career. Dan O'Bannon: Creating Fear (14 min. ): It's kind of funny to hear the director of Return of the Living Dead grouse about disliking gruesome horror flicks, but this interview with O'Bannon is still pretty intriguing; anyone who can make an analogy with mutilating eyeballs to skimpy lingerie can count on my attention. 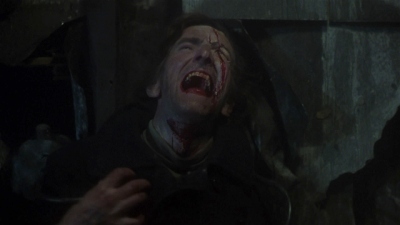 He doesn't say all that much about Dead and Buried in particular -- O'Bannon admits that he didn't think he even deserved screen credit -- instead speaking about the undead in general terms as well as what he believes to be the essence of horror. Trailers (5 min. ): Rounding out the extras are an international trailer, a domestic clip, and a teaser. Even nearly three years in, there really isn't all that much horror on Blu-ray, and what little there is tends to be big, loud, and dumb. Dead and Buried is what a horror movie ought to be -- creepy, atmospheric, and unsettling -- and even though its deliberately rough-hewn photography isn't exactly jaw-dropping in high definition, this criminally overlooked film easily ranks among the best the genre has to offer on Blu-ray. Recommended.